Artistic research is a new approach to making art that began in visual art and has recently expanded to performing arts, film, writing, and design. An artist begins a project by acting as more of a researcher than an artist, and only once he’s acquired a detailed understanding of a particular topic does he begin the more commonly understood practice of making art. 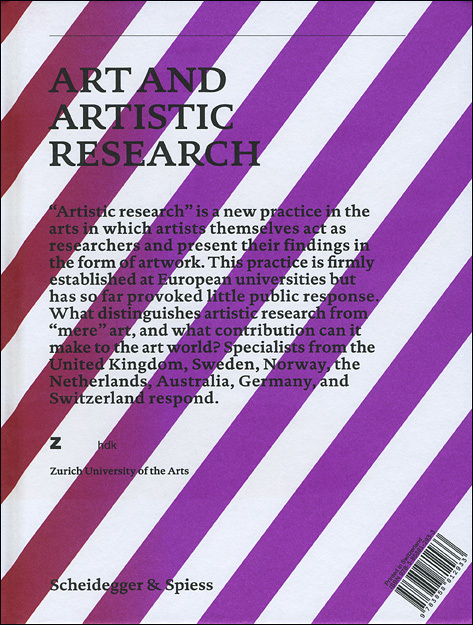 Art and Artistic Research brings together eighteen essays on various aspects of this technique, considering its development, its spread from English-speaking countries throughout much of Europe, and what it might have to contribute to the art world and to to society at large. A wide-ranging, theoretically informed collection, Art and Artistic Research will be an essential starting point for future discussions of this promising movement. Nina Malterud: Can You Make Art Without Research? Johan Öberg: Difference or Différence? Huib Schippers, Liam Flenady: Beauty or Brains?